Hotel Carmel package: Savor a spin on Highway 1 thanks to an electric bike. THE CALL HAS BEEN CLEAR: Big Sur is not closed. True, a stormy, slide-heavy winter led to closures along Highway 1, and the removal and rebuilding of Pfeiffer Canyon Bridge, but spots like Nepenthe and Post Ranch Inn have put out the welcome sign on the shore of Big Sur Island. Of course, the beautiful spot isn't actually an island, though it has taken on a number of island-like characteristics for the bulk of 2017 (arriving by car along a sizable swath wasn't a possibility early on). While a few cars are back on the road, though not all of it — Mud Creek to Salmon Creek is closed, as is the area around the Pfeiffer Canyon Bridge work site — the "island" aspect remains strong. That will change when the bridge opens down the road (later in the fall of 2017 is the current expectation), so those Big Sur buffs who want to see their favorite place in a different light are calling upon it now. And to help those who'd love to see it from the seat of a bicycle? HOTEL CARMEL... has a plan for that. 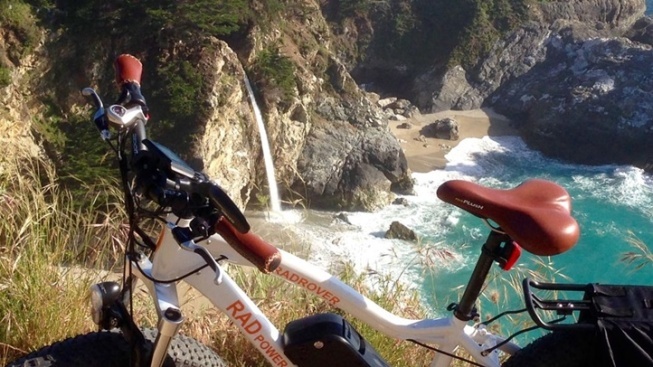 The Carmel-by-the-Sea property has teamed up with Big Sur Adventures to give guests a chance to book a half-day or full-day electric bicycle, one that can be used to spin along the picturesque stretch south of the Pfeiffer Canyon Bridge construction. There are some cars on it, thanks to Nacimento-Fergusson Road, but vehicles are not entering the area from the north or south at this time. If this tempts you, read up on the details, such as meeting your daily shuttle at Andrew Molera State Park and the trailhead at Pfeiffer Big Sur State Park. Island conditions remain, so you'll want to get all of the details on the trail, on hiking in, on where to find your bike, and what to do before you go Big Sur. Stop one, though, is your stay in quaint Carmel-by-the-Sea, and boutique, 27-room Hotel Carmel, a charming respite after your day wheeling about Big Sur Island.